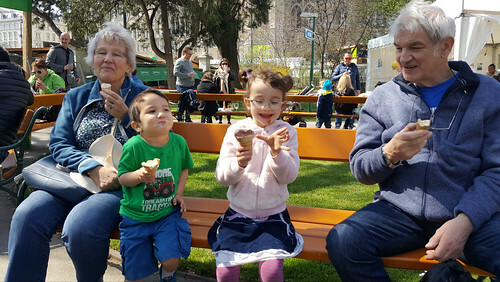 Keiki and Humuhumu on a bench eating ice creams with their grandparents. Who also have ice creams. It is difficult to tell who is most smug. This entry was originally posted at https://nanila.dreamwidth.org/1144621.html. The titration count is at .0 pKa. This is my entire Central European personal history in a single phrase. A lovely photo and the ice cream looks delicious. Thank you, and it was. Austrian gelato is very good. I suspect proximity to Italy can be credited for this. Vienna seems to involve a LOT of ice cream! So much happiness happening in this pic! It was an oft-repeated scene on this trip. The weather was fantastic.